For years, people around the world have looked to 3M for products and ideas that solve problems and make their lives easier and more enhanced. Leading through innovation 3M provide modern and practical solutions to help their customers succeed. Stainless steel is more and more becoming a stylish addition to any household but cleaning this piece of cutting edge design proves to be more of a chore than an experience. That’s why 3M have developed a product to combat exactly that. 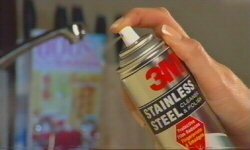 3M Stainless Steel Cleaner and Polish is an easy-to-apply invention that is ideal for stainless steel, chrome, laminated plastics and aluminium surfaces. With a high gloss formula, it wipes clean with no streaks or build-up, helps resist fingerprints and surface blemishes. 3M Stainless Steel Cleaner and Polish has a pleasant lime fragrance which makes it much easier to use than other potent cleaners on the market plus 3M Stainless Steel Cleaner and Polish is much safer to use as it contains no petroleum distillates. Use it and you’ll discover all your stainless steel appliances will stay fingerprint and smudge free for longer, thanks to 3M Stainless Steel Cleaner and Polish. You can find this groundbreaking product at your local leading supermarket and selected hardware stores.